A simple shell for a control to appropriately space out and segment sections of content on a page. It can utilize the control's default small element, as well as most other components (with additional styles). badge Adds a Badge to the control. header The text of the heading. 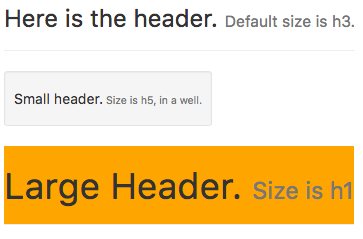 size The size of the text. Can be h1 (largest) to h5 (smallest). value The text following the header. Leave blank for none. Design time or runtime. well Display a border around the heading. None. Pageheaders are simply passive text.